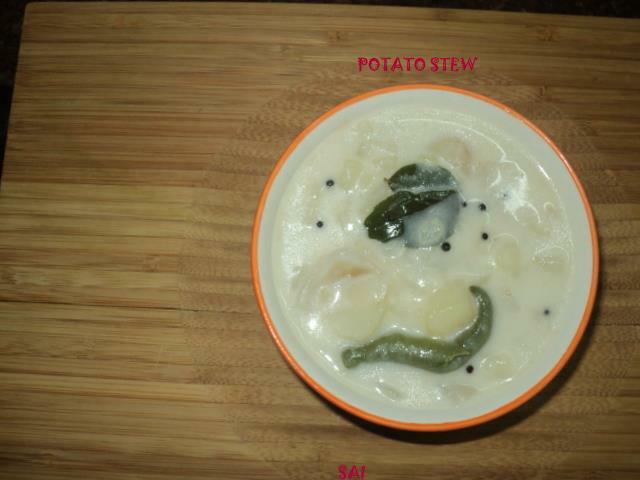 Batate or batato means potato.This is an easy peasy recipe.I prepare this often and this dish is filled with aroma of asafoetida.It hardly takes few minutes to cook this dish.Just add a cup of coconut milk to the same recipe if you want Potato stew at the final stage.Goes well with paez and with rice too. Take a pressure cooker,heat oil,splutter mustard seeds,curry leaves,hing and green chillies. Add chopped potatoes,salt to taste and water,close the lid and take 2-3 whistles,simmer for 5 minutes. Once the pressure releases open the lid,add diluted maida and take a boil,the gravy should be semi thick.